Emergency Financial Relief Program The Craft Emergency Relief Fund provides grants up to $6,000 and interest-free loans up to $9,000 to artists working in craft disciplines who are facing a career threatening emergency or disaster. CERF+ staff is available during the week from 8:30 am-5:30pm EST at 802.229.2306 and info@cerfplus.org to provide counseling and referrals to artists about emergency resources. Learn more. Call for Art The future of work is a topic of endless speculation. The “gig”/freelance economy, the open-plan office, and automation are seen as revolutionary trends with utopian or dystopian possibilities, depending on your perspective. The Future of Work seeks artworks in all media that relate to the idea of work as continuous, everyday labor. Please submit artworks in all media that relate to the concept of work. They can point toward the future, deal with the contemporary conditions of working life, or analyze the past. Submissions should conceptually engage with work as a facet of everyday life that affects us all. The Future of Work is guest curated by Joshua Fischer. Learn more. Poets Over 50 QuillsEdge Press has announced a call for verse from new, emerging, and established women poets for its anthology 50/50: Poems and Translations by Women Over 50. Poems in English may be submitted by poets who self-identify as women and are over the age of 50 regardless of country of residence. Members of underrepresented communities, including women of color, LBGTQ women, and differently-abled women are especially encouraged to submit your work. Learn more. Full Length Plays Native Voices at the Autry: 2018 Playwrights Retreat and Festival of New Plays is currently accepting submissions of full-length plays (60+ pages) by Native American writers addressing all themes and topics. The retreat and festival brings artists to Los Angeles to work on 3-5 plays for 8-10 days in May/June. Out of town artists receive roundtrip airfare plus lodging in Southern California. No fee to apply. Only submissions written for the stage or theatre by Native American, Alaska Native, Hawaiian, and First Nation artists will be accepted. Learn more. Call to Artists The Scantic River Artisans in Hampden has a call to artists for the upcoming exhibition Joy of Art, a juried show, October 14-15, 2017 at 105 Allen St, Hampden. Multiple categories available for artists across all mediums. Judging by Roc Goudreau and Michael Epaul. Questions, contact Nan Hurlburt or 413-205-7985. Call to Artists The Monson Arts Council Pop-up art exhibit featuring images of birds on Saturday, September 23 & Sunday, September 24, 2017 at House of Art, 200 Main Street. Monson Arts Council is seeking photographers, artists, and sculptors for open exhibit one weekend show For the Birds. Entrants ($5 fee for 3 pieces) may bring work – wired for hanging – to the House of Art, between 8:30 & 11am on 9-23-17. Ribbons will be awarded. Reception Noon to 5pm w. TAKE HOME: 9-24-17 at 5-6pm. Norcross Wildlife Sanctuary is sponsor. Contact: Maureen Solomon at monsonartscouncil@yahoo.com or call 413-267-3042. Writers, Poets, Photographers For an upcoming issue of Quarterly Concern devoted to work by immigrant and refugee authors, McSweeney’s is accepting fiction, nonfiction, poetry, and photography. Learn more. The Creative Entrepreneur Fellowship The Greater Boston Arts & Business Council’s CEF program includes personalized goal setting, coaching, a stipend, and an opportunity to showcase work at a capstone event. Learn more. Residency for a Mid-Career Painter The Fine Arts Work Center is pleased to announce the Stephen Pace Residency – a month-long residency for one mid-career painter at the FAWC complex located in coastal Provincetown, Massachusetts. The residency includes a fully equipped private apartment; separate private studio; and a living stipend of $1,000 per week. Learn more. Call for Videos, Animations, Computer Generated Work The Boston Cyberarts and the Massachusetts Convention Center Authority are issuing a call for proposals for their 23rd Round of Art on the Marquee at the Boston Convention and Exhibition Center. This 80-foot-tall Marquee offers more than 3,000 square feet of display area on 7 screens, providing full-motion video. They are looking for ten 30-second videos, animations or computer generated work, using the entire Marquee in colorful and creative ways. The Marquee is viewed by more than 100,000 pedestrians and motorists from 7am to 10pm daily. The Marquee is visible for half a mile in many directions, and is seen by traffic on Summer, D, and Congress Streets as well as from the surrounding hotels, office buildings and the Seaport World Trade Center. Eligibility is limited to artists and artist teams who reside in Massachusetts. Artists will need to create content in an After Effects template, which we will provide. Email proposals and include the following: Jpeg images of proposed arrangement of content on screens, or storyboard layout in sketch format or other illustration; links to past moving image work (up to 3 samples, 1 minute each): samples must be online (You Tube and Vimeo are acceptable); brief description of proposed piece (not more than one page); resume/CV. Boston Cyberarts and MCCA administration will review applications and award up to ten exhibition opportunities for the BCEC Marquee. Awards include a $500 honorarium. Selection of work is based foremost upon artistic excellence. They are particularly interested in works that push the limits of the 7 screens as a display platform while also creating dynamic engaging content for the public. Questions, email george@bostoncyberarts.org. Learn more. Call for Exhibition Proposals The Friends of the Jamaica Plain Branch Library are gearing up for a new round of submissions to select the exhibitions for 2018 season. These bi-monthly exhibits will be proposal-based, selected by a group of Boston-area artists and library affiliates. The Friends welcome artists from across New England to submit recent two-dimensional work for a solo or group show, each lasting for two-month periods. There is no specific theme, but artists are encouraged to include work that can be enjoyed by the diverse visitorship of the JP Branch Library, including children, teens, and other community members. Accepted work will be displayed in a public area of the JP Branch Library, and an accompanying reception will be organized by Uforge, their managing partner, on behalf of the Friends. Submission is free! Physical/in-person submissions will not be accepted. Learn more. Emerging Artists Fellowship The Greater Boston Arts & Business Council’s Walter Feldman Fellowship for Emerging Artists program supports the careers of emerging artists through the experience of solo exhibition, curatorial support, and professional development. Learn more. Memoir Prize Entries are currently being accepted for a a prize of $1,000 and publication by Kore Press for a memoir or memoir-in-essays by a woman writer. Cheryl Strayed will judge. Learn more. Printmakers Entries are currently being accepted for the International Print Center New York’s 57th New Prints exhibition, on view January 11 – March 31, 2018. Learn more. Deadline: November 9, 2017, 11:59 pm. 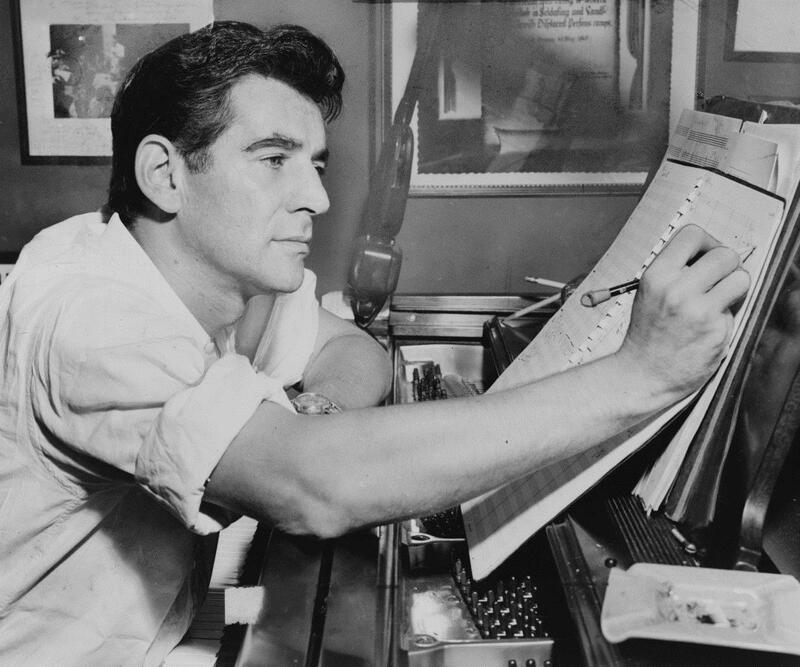 Image credit: Photograph of Leonard Bernstein at the piano, making annotations to a musical score. Al Ravenna, World Telegram staff photographer. Library of Congress. New York World-Telegram & Sun Collection.